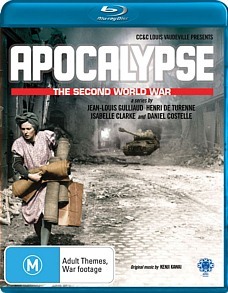 Apocalypse The Second World War Blu-ray Review. The entire project is truly a great achievement that stands as the only really accomplished colour series on World War II to date. There have been a number of documentaries in recent years that have portrayed the Second World War in colour, either by presenting a selection of period footage shot on colour stock or by colourising existing black and white footage. Until now both approaches have been found rather lacking - colour film was expensive at the time, and aside from Eva Braun’s home movies and a few reels shot surreptitiously by soldiers on the Eastern Front there wasn’t that much interesting colour footage to survive the war, certainly not enough to build a whole series around. The other approach has also been utilised rather haphazardly over the years, most recently on IMG Entertainment’s much-vaunted and rather misleadingly titled World War II in HD Colour, which whilst technically in colour certainly wasn’t in anything approaching high definition. Rather the end result was a soft, blurry and thoroughly disappointing affair which looked like it had been coloured by paintbrush, rendering military decorations as floating brown blobs and using various garish hues on skies and faces that completely detracted from the competent narration and the thoughtfully-compiled footage utilised throughout. Apocalypse: The Second World War takes a similar approach as its predecessor in providing a full-colour overview of the entire war, though thankfully this time around the colourification process is superb and the end result both moving and sublime. The six-part series is comprised entirely of period prints that have been painstakingly coloured, and the footage incorporated herein is both unflinching, endlessly engrossing and impeccably chosen. Much of it, in fact, is also extremely rare, such as the seldom-heard German secret service recordings, home movie stock, footage of Japanese naval crews aboard their battleships or sequences in which Hitler and Speer inspecting armaments: I for one must have seen three or four dozen WWII docos over the years, and I found plenty herein that was new to me. The entire project is truly a great achievement that stands as the only really accomplished colour series on World War II to date.